The 2013 Ambassador’s Fund for Cultural Preservation awarded $130,000 to fund the replacement of wooden beams, renovation of plaster and paint on the walls, and for the restoration of damaged floors and stairs in the church of Santa Teresa Convent. The inauguration ceremony was presided over by U.S. Embassy Chargé d’Affaires Larry Memmott, Cochabamba Bishop Monsignor Tito Solari, and Santa Teresa priest Fr. Linton Guzman. During the opening ceremony, Chargé d’Affaires Memmott noted that the Santa Teresa Convent is a Cochabamba landmark, a site renowned for its religious, historic, cultural and architectural value and that the restoration of the church will mean more visitors, more cultural events, and a more dynamic urban life in Cochabamba. 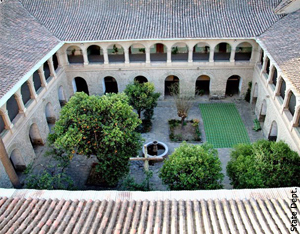 The Santa Teresa Convent, built in 1760, was one of the first convents established in Cochabamba. It has a unique design, modeled after the Italian Baroque style. The structure of the current church includes a circular dome, decorative architectural features, and a cloister surrounding a small garden. This project complemented a previous 2010 effort that restored six colonial chapels in the area of Curahuara de Carangas, Department of Oruro. 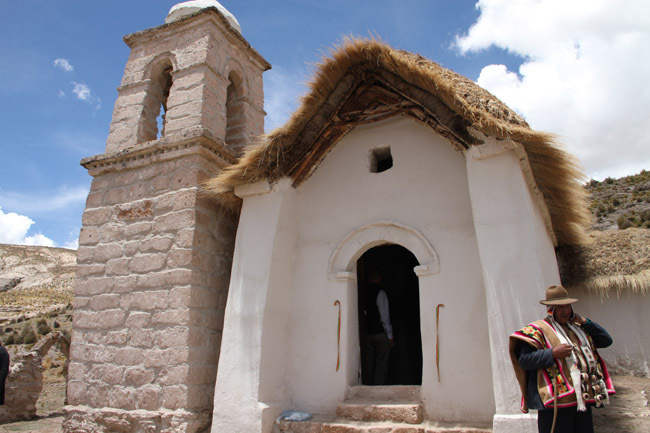 In total, there are now eleven restored colonial chapels in the high plateau communities of Huchusuma, Rosapata, Lerko, Santa Barbara, Quillviri, Kellcata, Ojsani, Cotasaya, Tomarapi, Sajama, and Lagunas. The restoration project was conducted by the international restoration group Centro Internacional para la Conservación del Patrimonio (CICOP-BOLIVIA) and included the active participation of the members of the rural communities. The town of Curahuara de Carangas, the main town in the municipality, is located in the Northeast area of the Oruro high plateau at approximately 12,788 feet above sea level in an inhospitable and remote region. By the end of the 16th century, a temple was built in the town, which has been nicknamed a “Sistine Chapel of the High Plateau.” The temple displays paintings whose earliest date goes back to 1608 while others were repainted in as far back as 1777. The “Sistine Chapel” is extraordinarily valuable because it has remained almost untouched. The temple and its decoration were finished in the late 16th and early 17th centuries. The frescoes on its ceilings and presbytery were painted in that period and display themes related to the Triumph of Christ and the Apostles. In the first nave there are scenes of the Final Judgment, the Last Supper, the Gospels, the Birth of Christ, and the Virgin. The choir, built in the 17th century, displays a typical chessboard motif at the base and the background while there is a Heart of Jesus, angels playing instruments, and Saint Sebastian and Saint Christopher painted on both sides. 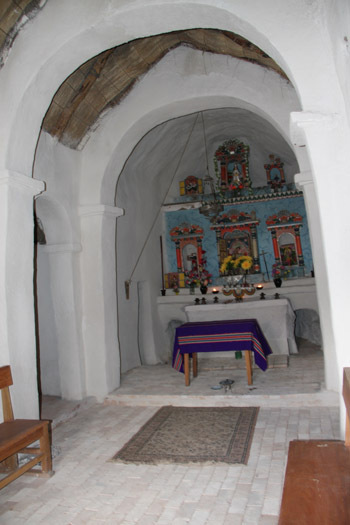 The smaller chapels scattered in the communities around the main town have a significant historic, cultural, and religious value and they contain works made by local community members centuries ago. Some of the chapels have outstanding murals depicting a variety of religious themes and altars that can be considered pieces of fine art. Most of the chapels date back to the 17th century and are architectonic landmarks that need to be preserved. The temple in Curahuara de Carangas and the chapels in the vast surrounding areas are monuments that serve as a testimony of both the spiritual and cultural vitality in this region of Bolivia. 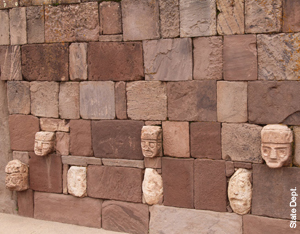 The project, submitted by the Municipal Government of Tiwanaku and the Ministry of Cultures of the Plurinational State of Bolivia, aimed to improve the conditions of the Tiwanaku Archeological Complex Warehouse to prevent the deterioration of thousands of archeological pieces and ceramics stored there. For many years, Bolivian and foreign researchers have found, and keep finding, ceramics and archeological artifacts; however, the conditions of the warehouse where the artifacts are stored were less than optimal. As a result of the funding provided by the Ambassadors Fund for Cultural Preservation, the warehouse will now have the adequate infrastructure and equipment to better preserve those historic items. The Ambassadors Fund for Cultural Preservation funded a project to restore six colonial-era chapels in the rural communities of Huchusuma, Rosapata, Lerko, Lagunas, Sajama, and Tomarapi, which are located in the municipality of Curahuara de Carangas, Department of Oruro. These chapels have a significant historic, cultural, social, and architectonic value. The donation of 41,076 US dollars was used to restore roofs, internal and external walls, and to install appropriate lighting for the chapels. 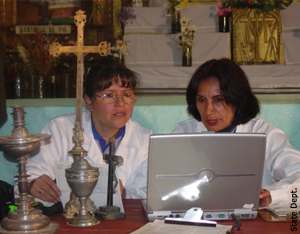 In order to preserve 500 archeological and ethnological samples, including pre-Columbian textiles from the Inca, Tiwanaku, and Aymara periods, the Bolivian Museo Nacional de Etnografía y Folklore (MUSEF) received a donation from the Ambassadors Fund for Cultural Preservation to equip their restoration and conservation lab. 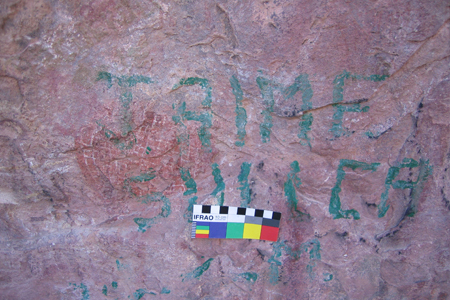 The purpose of this project was to preserve an exceptional rock art site that is part of the Bolivian cultural heritage: Lajasmayu Rock in the town of Betanzos, Potosí. Also, local guards and tourist guides were trained to foster tourism in this area. Rock art in Betanzos includes polychromic designs and sequences of traditional activities that date back thousands of years. The rock art scenes depict scenes of hunting of camelids and minuscule human-like figures. Unfortunately, unrestrained visits by the public resulted in damages due to ignorance or vandalism. Supported by the Ambassadors Fund for Cultural Preservation, Bolivian entity Sociedad Boliviana de Arte Rupestre (SIARP) worked for two years to clean the artworks from graffiti and to train specialized staff to maintain and manage this significant rock art site. This project was carried out in cooperation with Proyecto Arqueológico de Taraco and was completed in 2008. 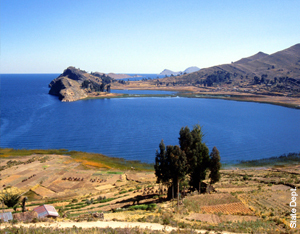 The area of Chiripa, located near Lake Titicaca, has underground structures that correspond to the formative period of an ancient Chiripa culture. These structures still contain religious artifacts that present-day communities have kept in the area. In order to learn more from those traditions, the project implemented excavations to preserve four houses of the formative period and to open them to visitors. This project was carried out by a team of Bolivian archeologists led by American conservation specialists from the University of Pennsylvania Dr. Frank Matero and Dr. Lindsay Falck. The Ambassadors Fund for Cultural Preservation provided funding to create an exhibit on the cultural heritage related to the exploitation of rubber and Brazil nuts in the Amazonian region of Bolivia. The exhibit was set up by Museo Pedro Villalobos at Universidad Amazónica de Pando. The donation funded the purchase of tools, artworks, photographs, video and audio clips aimed to preserve the rich cultural heritage derived from the main economic activities developed for centuries in the area. 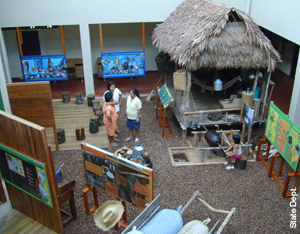 Museo Pedro Villalobos is now able to offer a permanent interactive exhibit to both Bolivian and Brazilian visitors who can learn about the culture related to rubber and Brazil nuts exploitation. Pando is a unique geographic region in Bolivia, one with a distinctively different cultural heritage from that of the rest of the country. This was an additional reason for the AFCP to fund this preservation project. 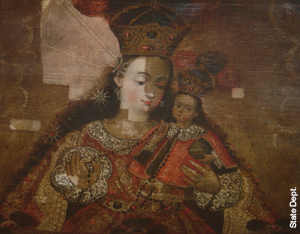 Under this project, 45 colonial paintings were restored for the new Sacred Art Museum of Oruro called San Miguel de la Ranchería. The paintings had been collected from a number of churches, temples, and convents over many years but their condition was lamentable. These artworks are representative of a rich history of Bolivian art produced in colonial times and correspond to the Cusco, Collao, and Potosí painting schools. The Vice Ministry of Culture of Bolivia led the restoration works in coordination with the Sacred Art Commission of the Diocese of Oruro. 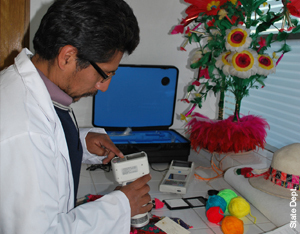 The project also contributed to strengthening human resources as the Vice Ministry experts trained junior restorers in Oruro during the process. This project created a national digital archive of the Bolivian cultural heritage. The funds covered purchases of digital equipment and software for the Cataloguing Department of the Vice Ministry of Culture. The catalogue included archeological artifacts, pre-Columbian textiles, ethnologic materials, and colonial artworks, among others. This fundamental repository is managed by the Ministry of Cultures of Bolivia and is also accessible by the Bolivian Customs Service. The United States, as other countries, has expressed its commitment to stopping the illicit trafficking of Bolivian cultural items in line with the objectives set forth in the Memorandum of Agreement. This project established an archive of musical works created in the Jesuit missions of San Ignacio de Moxos to protect more than 5,000 music scores composed during colonial times. The project was managed by Asociación Pro Arte y Cultura de Santa Cruz and provided infrastructure and equipment to protect music scores. 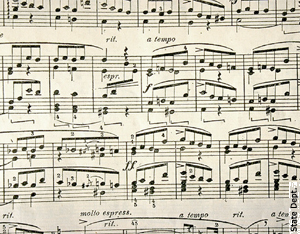 As a result of this project, these historic music scores are now available for music researchers, musicologists, and the community at large. This project consisted in the design and implementation of rooms for dance, music, and rituals of the Jalq’a and Tarabuco cultures. Equipment, furniture, and other supplies were purchased to set up exhibits in three new rooms of Museo ASUR. This effort contributed to preserve important elements of both ancient cultures. Although Museo ASUR primarily works to preserve textiles of those and other indigenous cultures in the Department of Chuquisaca and Potosí, they considered that engaging in preserving indigenous performing arts and ceremonies was crucial to show the rich cultural context in which the textiles are still being produced. This project was implemented in coordination with the Vice Ministry of Culture and the Quipus Foundation to create a digital photographic archive for Bolivia. 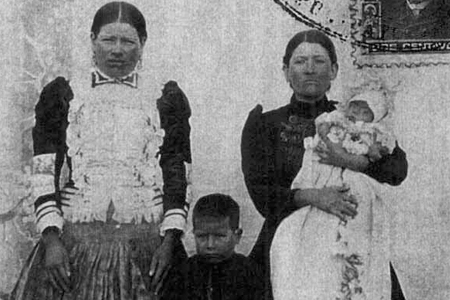 The archive is now a reality and is available to Bolivian and foreign institutions that wish to conduct research using resources from the Bolivian photographic patrimony. The archive has photographs with significant historic and cultural value, which were at risk of deterioration and loss. 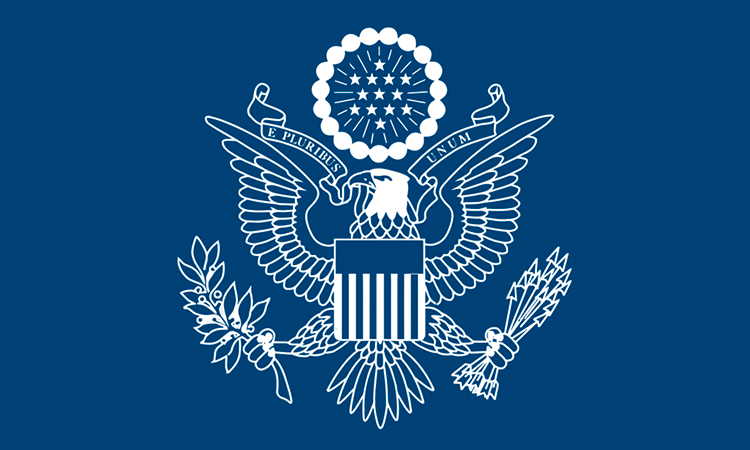 The U.S. Government contribution mainly consisted in providing the equipment necessary to create the archive. This digital photo archive was implemented shortly after the formalization of a Memorandum of Understanding for Cultural Preservation and this particular project also served the purpose of raising awareness on the importance of preserving and divulging the cultural heritage of Bolivia.